Our quiz bird appears to be preening its back so we can't see the bill, and bill shape is often very useful for placing birds into groups. Even though we can't see the bill, we can see other features that will lead to a positive identification. Our candidate has small feet and is perching on a wire fence so we can conclude that it's probably a passerine of some kind. Yes, some non-passerines like hummingbirds and cuckoos are adept at perching, but our bird is the wrong shape for a hummingbird, cuckoo, or any other "perching" non-passerine. Moving on, note how long the primaries are, reaching almost to the end of the tail, which is just right for a swallow. The underparts are bright white so we can eliminate Barn, Cliff, and Northern Rough-winged Swallows, and female and immature Purple Martins. All of these have brown or gray on the underparts. Bank Swallow also has white underparts but has brown upperparts. The upperparts of our quiz bird are blue. The only swallows recorded in Illinois that have bright white underparts and non-brown upperparts are Violet-green and Tree Swallows. Violet-green always has some white over the eyes, and enough of the face of our quiz bird is visible to see that there is no white above the eye. Also, male Violet-green Swallows have green, not blue on the back. The only Illinois swallow that has bright white underparts and bluish upperparts is Tree Swallow. 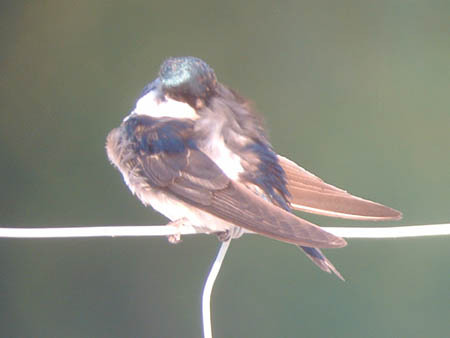 This adult Tree Swallow was Photographed on July 7, 2006 at Montrose Beach in Chicago.